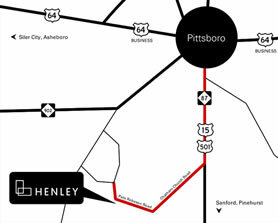 Just minutes away from downtown Pittsboro, Henley is conveniently located between Cary, Raleigh, Durham, and Chapel Hill, four of the Triangle's most prosperous cities. From the courthouse in Pittsboro, take 15/501 South for 3.6 miles, then take a right onto Chatham Church Road. Turn right onto Pete Robeson Road 1.8 miles later, then continue for 1.2 miles until you see the Henley entrance sign on your left. Use Google Maps to plan directions of your own.